Located on a beautiful glacial lake in the 70,000-acre Delaware Water Gap National Recreation Area, AMC’s Mohican Outdoor Center is an ideal retreat from the world’s cares. Stroll to nearby wetlands to spot the local wildlife, or hike the Appalachian Trail to magnificent views of the water gap. Or just splash or paddle in Catfish Pond and unwind. Just a 90-minute drive from New York City, Mohican is a great base for exploring on your own, with your family and friends, or with a larger group. With self-service cabins, comfortable lodge bunk space, and a fully-stocked kitchen, Mohican caters to those who appreciate value accommodations and prefer to bring or cook their own meals. 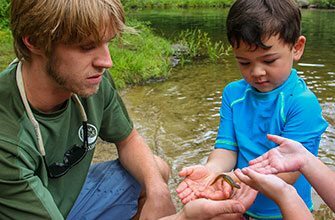 For a guided experience, Mohican’s weekend getaway programs offer the chance to learn a new skill and get to know other fun outdoors folk. Mohican offers several self-service cabin options, ideal for groups who wish to cook their own meals. Pillows are provided – bring your own sleeping bag and towels. Our Demo Center offers guests the opportunity to try out Deuter backpacks, LEKI poles, MSR snowshoes, LOWA boots and JetBoil stoves. Sorry, no pets allowed. Great for weddings, family reunions, and retreats, packages include exclusive use of all lodges with over 60 available bunks, private and lakeside campsites, boathouse and dining hall Space (each multi-use space can accommodate 100 guests), council fire ring, and free use of canoes and kayaks. The boathouse and dining hall are available to rent and can each comfortably fit 100 people. The boathouse offers pristine views of the Catfish Pond and has tables and chairs. The kitchen is not available for food preparation, but catering is welcome. Blueberry Hill and Black Oak Lodge offer sleeping accommodations for up to 16 people in multiple bedrooms, restrooms and showers, full kitchens for self service groups, and are heated. Blueberry Hill includes a fireplace for ambient heat. Private rentals are available year-round, but require a 12 person minimum. Blueberry Room 201 now has 1 bunk bed (twin) and 2 single beds (Twin), allowing for 3 bottom bunks in one room. Trails End Lodge offers sleeping accommodations for up to 16 people. Seasonal showers and restrooms are located at the Dining Hall (April-October). Accommodations include wood stove heat and a full kitchen with running water (April-October only). Private rentals are available year round, but require a 10 person minimum This camp is ¼ mile from the parking lot. Please see a staff member for a 15 minute loading and unloading pass. Woodland Cabin offers sleeping accommodations for up to four people and includes a small fridge, microwave, coffee maker, fans, and heaters, a double bed, and bunk bed. There is a two person minimum to reserve privately. This cabin is ¼ mile from the parking lot. Please see a staff member for a 15 minute loading and unloading pass. Larch View Cabin offers sleeping accommodations for up to eight people in two rooms. Each room has 4 bunks. Guests may rent one side or the whole cabin. Seasonal showers are available at the Dining Hall for $5 (April-October). This cabin is ¼ mile from the parking lot. Please see a staff member for a 15 minute loading and unloading pass. Mohican offers several options for camping, including group, private group, tent platform, and walk-in campsites. Learn more about Mohican Outdoor Center’s campsites. (May – Sep) Mohican offers meals when given 2 weeks notice. We can do meal service for any size group. (Oct. – Apr) Mohican offers meals when given 2 weeks notice. We can do meal service for groups of 4 or more. We are not able to accomodate pets at Mohican Outdoor Center. Hike, snowshoe, paddle, swim. Whatever your outdoor interest, Mohican Outdoor Center, in the Delaware Water Gap National Recreation Area, has that. Hike through quiet woods to breathtaking waterfalls and soaring cliffs on the nearby AT-the most iconic of long-distance trails. Catfish Pond is a refreshing swimming hole and also offers great paddling and fishing. Unwind by the water or land a nice bass, perch, pickerel, or sunfish. Mohican has 13 kayaks and 9 canoes! For full camp rentals, groups can then rent all our boats. From hawks on nearby Raccoon Ridge to snakes, lizards, and salamanders, the wildlife in our wetlands is on full display on a quiet, early morning walk. The right clothing and gear are essential in the unpredictable weather of the Northeast. Even if it feels like summer in the valleys, it can be cold and winter-like on the high peaks. Use our gear guides to make sure you’re packing everything you need for comfort and safety. Guests staying in our cabins and lodges should bring a sleeping bag, sheets, or a sleep sack, as well as towels and toiletries. Guests staying at campsites should bring a tent, sleeping bag, and cook stove (no open fires permitted). Campsites include access to outdoor privies, and showers are available at the Visitor Center ($5/person, includes towels).